The Las Vegas Valley water system connects nearly 400,000 homes and businesses to the community's water supply through a vast labyrinth of water mains and service lines. 79 reservoir basins and tanks that collectively hold nearly a billion gallons of water. 54 pumping stations with the capacity to move more than 1 million gallons of water per minute. More than 6,500 miles of water transmission and distribution pipelines. 76 production wells and 26 recharge wells capable of producing more than 200 million gallons of water per day. The Las Vegas Valley Water District manages this complex water distribution system to deliver water to more than 1.5 million people in Las Vegas and surrounding areas. Our service area includes metropolitan Las Vegas, areas of unincorporated Clark County, Blue Diamond, Coyote Springs, Jean, Kyle Canyon, Laughlin (Big Bend Water District), and Searchlight. The Water District manages additional facilities and infrastructure to serve these outlying areas. A complex network of pipes, pumps and reservoirs work in harmony to supply drinking water to our community. Water pipelines, which can be larger than 8 feet or smaller than an inch in diameter, form the backbone of water distribution around the Las Vegas Valley, carrying water to buildings, fire hydrants, and other water use points. 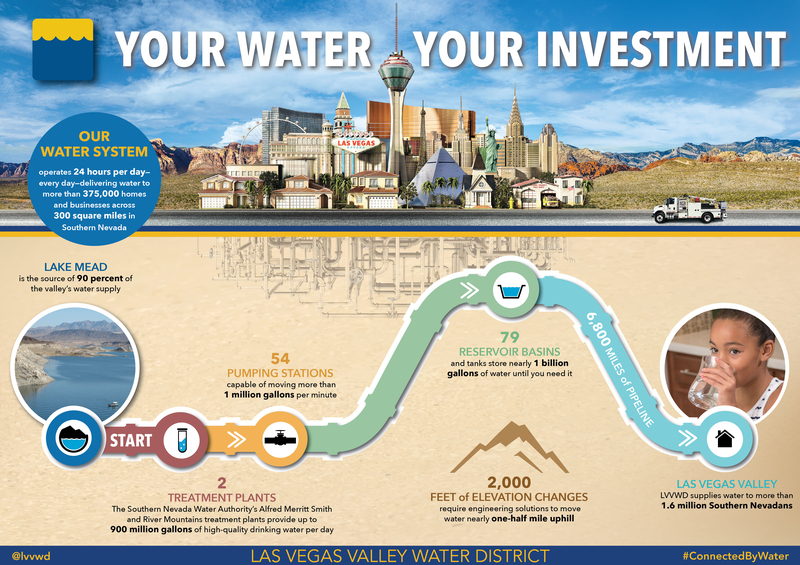 The infographic above depicts the fact that our water system operates 24 hours per day-every day-delivering water to more than 375,000 homes and businesses across 300 square miles in Southern Nevada. The process begins at Lake Mead, which is the source of 90 percent of the valley’s water supply. It then moves along to two treatment plants, Alfred Merritt Smith or River Mountains, which provide up to 900 million gallons of high-quality drinking water per day. From there, there are 54 pumping stations which are capable of moving more than 1 million gallons per minute. 79 reservoir basins and tanks which store nearly 1 billion gallons of water until you need it. 2,000 feet of elevation changes require engineering solutions to move water nearly one-half mile uphill. 6,500 miles of pipeline brings the water to the Las Vegas Valley, where the Las Vegas Valley Water District supplies water to more than 1.5 million Southern Nevadans. For more than a half century, the Water District and its customers have been investing in one of the nation's most reliable water delivery systems. That investment has paid off. Instances of water main breaks in Southern Nevada are below the national average and our water system has an efficiency rating that is considered world-class. Ensuring that our water delivery network remains among the nation’s most reliable requires proactive maintenance. Two-thirds of capital projects scheduled for the next decade focus on repairing and replacing aging water system components. The balance is split between water quality protection and new water facilities. Construction is under way on a new reservoir in Summerlin that will hold 10 million gallons of water and enhance water resources for current residents as well as supply the new neighborhoods that have recently been built or are under construction in the area. Construction costs for the community's water system account for more than half of the Water District's annual expenses; staffing costs account for less than one third of the not-for-profit agency's budget. This investment in the water distribution system will keep costs down and save our community many millions of dollars, as proactively taking action is cheaper and less disruptive to residents than fixing water system failures. After water from Lake Mead (the source of most of Southern Nevada's drinking water) has been treated, it's pumped uphill to reservoirs throughout the valley. These reservoirs store the water until it's needed. High-power pumps at pumping stations force water from the reservoirs to transmission pipelines, usually at night when the cost of power is less. Major transmission mains move water from treatment plants and reservoirs, and, finally, gravity delivers water through distribution pipelines to your home or business. Wells are used to tap into our groundwater supply, mainly during summer periods of peak usage. They also are available for emergencies. During some winters, treated Colorado River water is injected into the local aquifer, where it is stored for Southern Nevada's future use. This artificial recharge gives nature a helping hand in maintaining our groundwater supply. Wells can pump anywhere between 400 and 4,000 gallons of water per minute. Combined, our 66 operational production wells can produce approximately 170 million gallons of water per day. For more information about the groundwater wells maintained by the Las Vegas Valley Water District, as well as personal or community wells, visit the Las Vegas Valley Groundwater Management Program website, LasVegasGMP.com.